The Model County were ultimately well beaten in this afternoon’s All-Ireland senior camogie semi-final. 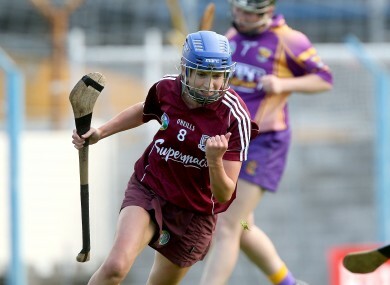 Galway's Niamh Kilkenny celebrates scoring the first goal of the game. WEXFORD’S FOUR-IN-A-ROW bid came to an end at the hands of old rivals Galway, who will now play Kilkenny in the Liberty Insurance All-Ireland senior camogie final after this deserved victory in Semple Stadium. With seven of last year’s championship-winning team unavailable, it was always going to be difficult for JJ Doyle’s crew, and though they battled throughout, they never looked like making it to Croke Park once Niamh Kilkenny rattled their net in the 23rd minute. The Model County had just two players in the full-forward line into a very strong wind and would have been very satisfied to be level at 0-2 apiece at the end of the opening quarter. Their two points came from frees and that told a tale in itself as all their scores came from placed balls. Indeed the entire game was a stop-start affair punctuated by frees but as Galway gained dominance around the middle, they gradually pulled clear. Niamh McGrath slotted three points before Kilkenny drove beyond the helpless Mags D’Arcy and an injury time point from Ailish O’Reilly left it 1-6 to 0-2 at half time. With player of the match Therese Maher revelling in being a free player at centre-back, the westerners fired over three of the next four points to extend the margin to nine. Wexford raised their levels in response and Jacob converted a free, before Kate Kelly fired over from 75m. Any chance they had was lost when Katrina Parrock received her second yellow card and was sent off in the 48th minute. Jacob converted another free but Galway remained comfortable and points from Kilkenny and Noreen Coen removed any doubt. Email “Galway end Wexford's hopes of four-in-a-row”. Feedback on “Galway end Wexford's hopes of four-in-a-row”.